Coal industry jobs have declined steadily in recent years. When Donald Trump signed an executive order today that initiated a review of the Clean Power Plan (CPP) and unraveled other Obama-era energy orders and memorandums, he did so with the stated intention of creating and protecting jobs. But the verdict is still out whether that goal will be accomplished. 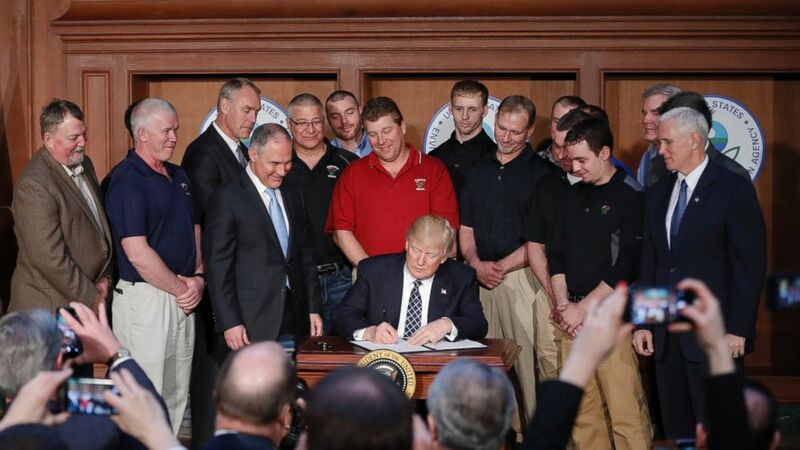 "We love our coal miners, great people," Trump said after signing the order. "I made them this promise: We will put our miners back to work." The divide of opinion seemed to be set along the lines of one's proximity to the coal industry: Representatives of coal workers who spoke to ABC News seemed to agree with the administration that the executive order would help protect jobs or spur job creation, while economists and environmentalists disagreed. Trump made job creation a central part of his campaign for president, and he trounced his opponent, Hillary Clinton, in coal-dependent regions like West Virginia, which he won by a roughly 40 percent margin. (Pablo Martinez Monsivais/AP Photo) President Donald Trump, accompanied by Environmental Protection Agency (EPA) Administrator Scott Pruitt, third from left, and Vice President Mike Pence, signs an Energy Independence Executive Order, March 28, 2017, at EPA headquarters in Washington. The coal industry was especially fertile territory for Trump's jobs promises, having lost tens of thousands of jobs over the last three decades, according to the U.S. Department of Labor. According to the department, the number of coal jobs dropped to 98,000 in 2015, from over 186,000 in 1985. Likewise, facilities that burn coal are shutting down. The Sierra Club, an environmental advocacy group, boasts that 251 coal-burning power plants have shuttered since 2010 or are scheduled to close. Vice President Mike Pence returned to Trump's campaign theme of jobs at a rally in Charleston, West Virginia, on Saturday, raising the curtain for today's maneuvers. "We're going to bring back jobs," Pence said at the rally. "We're going to get Washington out of the way of energy producers and coal miners because energy means growth for America, and President Trump digs coal." Scott Pruitt, the head of the Environmental Protection Agency, who has criticized federal regulations throughout his career in public life, stressed the theme of job creation in relation to the executive order, telling ABC's George Stephanopoulos on Sunday that Trump's efforts will help not just the coal industry. "It will bring back manufacturing jobs across the country." Pruitt said. "Coal jobs across the country." White House press secretary Sean Spicer told reporters today that he could not put a number on the jobs that would be created by the administration's new executive action on energy but said that the mining industry was for it. "I will tell you that, from a mining perspective, the miners and the owners are very, very bullish on this. So the people in the business applaud this effort, believe it will do a lot to revive the industry," he said. "I know that the industry itself said so." (David Goldman/AP Photo) Scott Tiller, a coal miner of 32 years, looks over a belt moving coal out of an underground mine in Welch, W.Va on May 11, 2016. 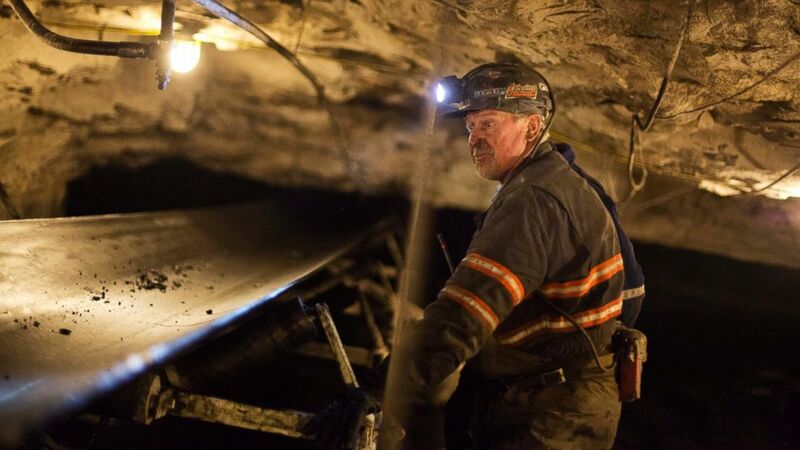 Phil Smith, the director of communications and governmental affairs for the United Mine Workers of America, believes Trump's actions have the potential to save "tens of thousands of coal and coal-related jobs." "We believe the Clean Power Plan, as proposed, was flawed. That is why we joined the suit to keep it from going into effect," Smith told ABC News. "Since the CPP had not gone into effect yet, it hadn't cost any jobs. But we estimated that it would cost tens of thousands of coal and coal-related jobs once it was fully implemented. Those jobs will not be at risk in the future from this source now." Bill Raney, the president of the West Virginia Coal Association, echoed Smith's thoughts but declined to estimate how many jobs would be saved or created. "The number of jobs is very difficult to quantify, but it brings with it a good, positive attitude about the coal industry," Raney said. He said he was hopeful that the administration would pledge to invest in coal research, which he asserted would help the industry compete with renewable energy sources, like wind and solar, that were favored by the Obama administration. "We're hoping that there's going to be a ramp up of research after this action," Raney said. Outside the coal industry, however, voices on the subject were considerably less sunny. Richard Revesz, the director of the Institute for Policy Integrity, a nonpartisan think tank at the New York University School of Law dedicated to improving the quality of government decision-making, told ABC News by email that the order will ultimately hurt the economy. "There is no consistent evidence that regulations contribute to long-term changes in the unemployment rate, and rolling back regulations will not create jobs," he said. He noted that coal jobs have been lost mainly because of increasing automation and the low price of natural gas, which will not be affected by a reconsideration of the CPP. Moreover, the executive order threatens a policy that "aims to give taxpayers fair market value for coal mined on public land, and it tries to eliminate a tool used to evaluate economic damages from climate change," he said. "This executive order will hurt our economy," Revesz said, "not boost domestic energy or create jobs." Christopher Knittel, the director of the Center for Energy and Environmental Policy Research at the Massachusetts Institute of Technology, agreed with some of Revesz's criticisms but called a decline in gas prices "the most important factor" for the reduction in coal jobs, followed by state-level renewable energy policies. "So neither of those things are at all related to the Clean Power Plan," Knittel said. "Those things will still exist even after today's executive order." He said Trump's pro-drilling policies could continue to drive down gas prices, which would work against bringing back jobs in the coal industry. "The president's energy goals run counter to each other," Knittel said. He agreed with Raney that research would help the industry but argued that if Trump is serious about saving coal industry jobs, he will invest in carbon capture and sequestration technology and enable coal workers to sell their product abroad to places like Europe and China. "That would allow for our coal to burn in a more climate-change-friendly way not just in the U.S. but internationally as well," Knittel said.